Lake Tahoe has some great tours you can take with your family. From tours of mansions and castles to photography, skiing, hiking and other outoors-themed tours, each one will give you better sense of the history, biology, geography and beauty of this alpine lake. Here are our Top 10 tours to take around the lake. The Vikingsholm Castle in Emerald Bay is one of the quintessential visuals of the lake. Can you imagine living in this stone castle at the foot of the mountains, right in front of Lake Tahoe? Well, that's what Lora J. Knight did for 15 summers since 1928. 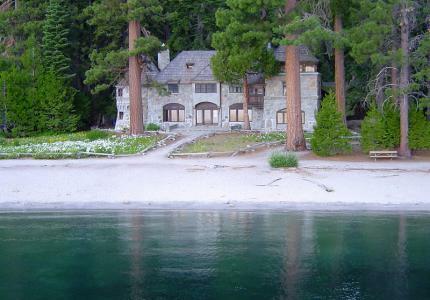 Vikingsholm, built with a Scandinavian theme, was used as a summer getaway for wealthy people up until the 1950s when it was acquired by the State of California for use as a state park. Tours of Vikingsholm are available seven days a week from Memorial Day weekend until the end of September. The first tour of the day starts at 10:30 A.M. and the last tour at 4:00 P.M. All tours are guided tours and take approximately one-half hour. The tour fee is $10.00 for adults and $8.00 for children (7-17). Children under 7 are free. Limited parking is available at the Vikingsholm parking area off Highway 89. You will need to hike down about a mile to get to the mansion. Hot Tip: Fannette Island is not included on the tour, but your can visit the island via kayak, which can be rented from the beach near the mansion. This historic lodge on the East Shore was built by George Whittel, Jr in 1936. This castle on the lake contains a Lighthouse Room, a servant's quarters, a card and gambling hall and even a 600 foot long underground tunnel leading to the boathouse. The Lodge is available for weddings, Winemaker dinners and other special events and even has its own yacht ( Tahoe ) - which offers waterside views of Lake Tahoe. Land and water tours, school tours and private group tours are available of the Thunderbird Lodge.Reservations are required for all tours. Self-guided tours are not available. You can make reservations by visiting the website. Hot Tip: If you kayak from Sand Harbor south, you can see the Thunderbird Lodge from the water. However, remember this is private property, so please don't trespass. The Taylor Creek Visitor Center offers self-guided trails and tours of the Tahoe creeks and river as well as its wildlife. The Stream Profile Chamber is a popular feature, especially in the fall when the Kokanee Salmon are spawning and the fall colours are peaking. Visitors can go under the water in a protected hallway to view the fish and river life underwater. There are also diorama displays of local Tahoe wildlife, trees and flowers. The local trails are free and great for small children or the disabled. The Lake of the Sky Amphitheater offers special evening programs in July and August. Hot Tip: Small children will get a kick out of trying to find hidden animals in the diorama displays. Also, if you're visiting here during the Kokanee run, be aware that the bears like fish too! Keep children and dogs close. The Tahoe Adventure Company offers full day tours of the entire Tahoe area. Kayaking, mountain biking, rock climbing, snowshoeing and even full-moon and star tour snowshoeing adventures can be booked with this dedicated company. Their guides are fully trained and know the area like the backs of their hands. Day trips include all equipment, natural and human history as well as van shuttle when necessary. The guides serve a full lunch at beautiful locations and try to get you back to your hotel by the afternoon. Hot Tip: You can even custom design your own adventure with the Tahoe Adventure Company. Since 1934, the Camp Richardson Corral has offered guided horseback rides, wagon rides, steak and barbecue dinner rides and backcountry pack trips. In the winter, the company offers winter sleigh rides through the pine trees and hills. Guided pack tours start at around 1 hour and can go for several days with guided pack animal camp tours. They even offer pony rides for very small children. Summer hay rides cost around $30 a person and the dinner rides include a full steak dinner. Hot Tip: Private winter sleigh rides are available for weddings. The Tahoe Maritime Museum at the base of the Homewood ski resort celebrates the history of boating on the Lake of the Sky. Exhibits such as antique and vintage woodies, Native American kayaks, outboard motors and marine knots are displayed in a beautiful building with large windows looking out on the lake and mountains. There are several interactive sailing and boating games for children and lots of historical information for adults. Hot Tip: The museum's lecture series takes place on Thursdays at 5:30 and costs only $8 for non-members. If you are a budding or experienced photographer, you are sure to learn something from Keith Price as he takes you to the "secret" places around the lake to capture the perfect shot. The photography tours include door to door service in the South Shore, photography of your tour, history, geography and wildlife information and access to some spectacular locations around the lake. Hot Tip: Custom tours are offered including sunset and sunrise tours, snowshoe and wedding tours. If you want to see the South Shore from high above, Lake Tahoe Balloons has early morning flights that launch right over the blue water of the lake. The staff and flight crew of Lake Tahoe Balloons are all FAA certificed instructors and the "Tahoe Flyer" is the the world's only Hot Air Balloon launch and recovery vessel that is U.S. Coast Guard certified. Packages are around $300 a person and include adeluxe continental breakfast, boat cruise, an hour flight and champagne toast. Hot Tip: Balloon trips are also available for special events like honeymoons and weddings. The Tallac Historic site in South Lake Tahoe features several restored estates owned by wealthy vacationers in the late 1800s and the early 1900s. Several homes are open to the public and guided tours and art exhibits are available.The Pope Estate was built in 1864, Valhalla was built in 1923 and has beautiful wood floors, an open wood beam ceiling, a balcony of lodge pole construction and a 20 foot high stone fireplace. It is now the site of summer concerts, the Cultural Arts Gift Store and is available for rental. Hot Tip: The Valhalla Boathouse Theatre offers various shows for all ages during the summer. If you've never been in a helicopter. Lake Tahoe might be the best place to have your first trip. Reno Tahoe Helicopters offers several scenic tours of the entire Tahoe area all year. From flights over the South Shore and the North Shore, to flights over Tahoe waterfalls, Sand Harbor and Emerald Bay, you will get a birds-eye view of the lake. A 10 minute flight over Emerald Bay costs about $70 a person. Hot Tip: Reno Tahoe Helicopters also offers sunset wedding tours for $750 a package.